Finding the perfect bed is a tough enough task on its own (we tried to make it easier with some of the best options on the market), but it gets even more complicated when you are on the hunt for something that provides optimum comfort for two different sleepers. What if you and your partner prefer a mattress with two different firmnesses? Would someone have to compromise if you and your partner have a different taste in that department? How to Choose The Ideal Couple Mattress? Investing In A New Mattress For You And Your Partner? In the fast-paced modern-day life, there is nothing more important than a peaceful night's sleep. But everyone knows from experience that finding the perfect combination of a mattress and pillow is an arduous journey that takes a lot of time and sheer commitment. And once you reach the promised land of a decent night’s sleep without any backaches in the morning, you'd rather do almost anything else than change that perfect combination. Couples that love a memory feel can see the exceptional value created by the folks at Nectar. A bed with a deeper contour, yet easy to move around on, and with a plush feel, it delivers on comfort using high-quality materials. Unlike other beds that only allow heavier areas to sink in, even lighter parts of the body like hands and arms sink in for a uniform feel. What stands out? When taking a look at the overall package of the mattress, the value is clear. Nectar is an exceptional price for what it offers, including a wicking cover, cooling gel infusions, and thick layers of pressure-relieving foam supported by a dense base. A significant advantage for sleepers that also plays into the value is the 365-night trial period. Not only is the bed a fantastic option, but you have a full year to allow your body to adjust and determine if it will be around for as long as its Forever Warranty. Find more about this model in our complete review here. Helix presents a tailored approach to beds for two. They believe that people have individual needs and preferences, which should not suffer by significantly compromising on one bed. 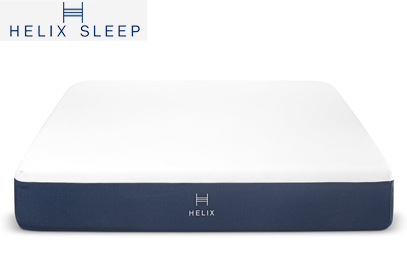 After each person fills out Helix’s quick online questionnaire, the company offers two solutions – the brand will select a custom blend of materials to satisfy both parties who fall within a range of similar needs, or they will split the bed in two (without seams) so each person has their own optimal comfort level. The quiz surveys couples on their current quality of sleep, the positions they sleep in, as well as preferences on firmness and body shape. This helps determine the temperature regulation, point elasticity, support, and overall feel that Helix will cater to through pocketed micro coils, Helix Dynamic Foam, memory foam, and a high-grade polyfoam. What makes it unique? With personalized customization on two sides of the bed, or the option to select a happy medium for both parties, Helix helps couples whether they have similar or vastly different preferences. See more about this customizable option made by Helix in out in-depth analysis. 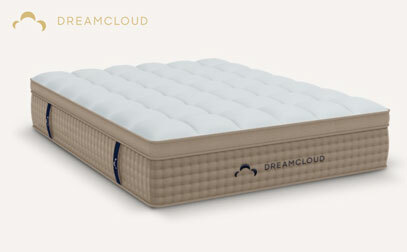 Affordable luxury may sound like a paradox, but DreamCloud brings the idea together tangibly in a hybrid solution that looks great and feels even better. A base layer of coils provides a deep bounce that is good for sexually active couples, as well as support that aids both parties in proper spine alignment as they sleep. Layers of memory and natural latex foams join together to bring contouring comfort, so waking up sore is a thing of the past. Motion transfer and edge support are two other factors that can be important for couples, and DreamCloud delivers on both. Pocketed coils and motion-halting foams provide a surprising amount of motion isolation on a bed with springs. There is reinforced edge support, meaning couples can use the full surface of the mattress. Why is it special? DreamCloud offers comfort and support in an eye-catching design. It has an extended 365-night trial, Everlong Warranty, and is far less than comparable in-store brands, making indulgent nights within reach. See our DreamCloud analysis for more info about construction, motion transfer and more! If one or both of you feels like they have tried every type of bed to no avail, it could be time to consider the amazingly configurable Luxi mattress. In Queen sizes and above, the bed is split in the center. A clamshell cover is easily unzipped, and you can reconfigure the layers to the Soft, Medium, or Firm settings with one or two flips. With each side ready to be switched to three different firmness levels, there are nine total choices you can make regarding the firmness levels in the bed. The clamshell cover has an inch of memory foam quilted to it, so you should have a smooth transition with no worries of feeling a seam if you happen to wander away from your side. What’s its best feature? Luxi’s three-in-one/nine-in-one capabilities. We also love that the company will provide consultations if you need further customization, which they do in an effort to keep their customers happy and to cut down on the number of mattresses ending up in landfills. See more about the three-in-one capabilities of Luxi in our full analysis here. Heavier couples can have a hard time selecting an option that is supportive enough for two. WinkBed Plus says they have created the very first luxury bed geared towards sleepers 300+ pounds. It is a hybrid option, with supportive coils underneath comfort layers containing cooling gel and responsive latex. What stands out? The brand has taken a lot of care to see to the needs of heavier couples. The materials and stitching are durable, the springs triple-zoned, and reinforced edges mean there is more usable space on the mattress without the risk of rolling off. 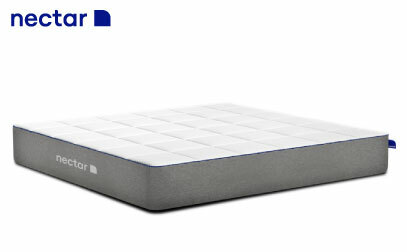 The coils and latex create a highly-responsive mattress with deep bounce. Consequently, moving around is easier, whether getting out of bed or turning throughout the night. For couples who find themselves in need of more advanced temperature regulation, WinkBeds manufactures an optional coolControl™ base designed to work with the Plus that can provide cooling or heating to the mattress. Each side can be set to a different temperature, for even more individual customization. We reviewed the Plus here; check it out if you want to learn more about it. For many couples, eco-friendly products provide peace of mind through safe and sustainable materials. Avocado is a hybrid with a base of upcycled steel coils and natural Dunlop latex on top, delivering bounce that many couples find enjoyable. Couples who want to make sure their pressure points are well-cradled will benefit from the optional pillow top for sale along with the standard version. What makes it unique? Setting themselves apart from other brands who claim to have organic and natural materials but fail to provide certifications, Avocado has obtained several industry-recognized standards that show the brand’s commitment to safe materials and manufacturing. There are no petroleum-based foams or synthetic latex; the bed has natural Dunlop latex sustainably harvested from rubber trees surrounding its coils. The bed is eco-INSTITUT Certified, with a cover that includes GOTS-certified and Global Organic Textile Standard Certified organic cotton. Natural New Zealand wool adds comfort and wicking and one percent of the company’s revenue is given back to environmental nonprofits. 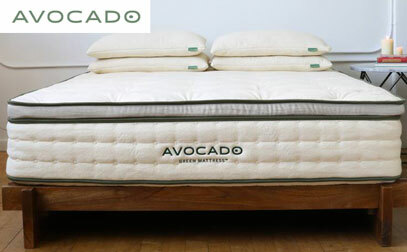 We analyzed the Avocado bed's attributes, and if you want to see more, you can skip to our full review here. 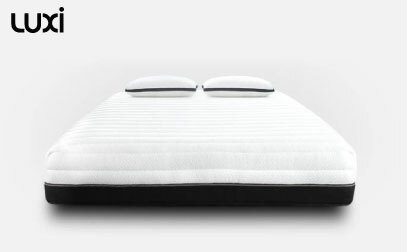 Loom & Leaf’s Firm option is great for couples who need firmer support but love a memory foam feel. 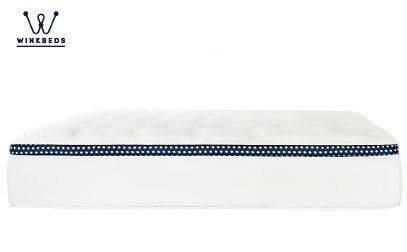 If both of you sleep either on your back, stomach, or a combination, this is a bed that shines in the areas you need. Above the first layer of foam is a cooling spinal gel layer in the lumbar region. While some foams can sleep hot, this gel layer will regulate temperature while providing further support. In addition, the first layer (also injected with a cooling gel) has an egg crate shape that allows air to flow, ultimately helping with cooling. Why is it special? 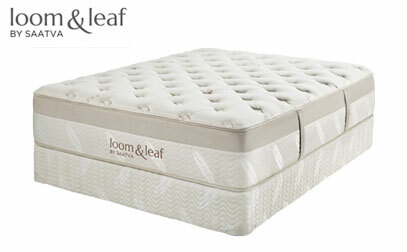 Loom & Leaf feels like a premium-tier bed with a much lower price tag. So, if you and your partner like a more supportive feel, you can snag a great deal in a firm memory foam mattress. Free white glove delivery, as well as free mattress removal, are part of the Loom & Leaf purchase. Professionals will move the mattress through your house and install it, so you can rest easy from the moment it arrives at your door. See our complete analysis of Loom and Leaf here if you want to know more about the supportiveness and materials used in it. Sometimes couples need a good budget choice, which this factory direct bed by Dreamfoam Bedding can supply. 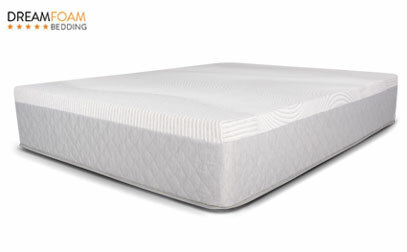 With a medium level of firmness, Ultimate Dreams Supreme caters to the majority of side, back, and stomach sleepers. People who sleep in a variety of these positions will also be well-served. Ultimate Dreams Supreme has a 1.5-inch memory layer on top, which is injected with gel that serves to draw heat from the body and keeps sleepers cooler. Underneath that layer is a 2.5-inch memory foam that works with the top layer to provide great pressure relief and contouring. Underneath is a dense supportive foam. What stands out? A memory foam bed on a budget, Ultimate Dreams Supreme helps couples who need to watch their wallets get a supportive and comfortable sleep. The makers claim their bed sleeps 33% cooler, and that is a great feature to have, especially on a budget. See the full review of this budget-friendly option here if you want to learn more. The most important thing is to have a clear idea of what you expect from your purchase and try and find the optimal solution that suits sleeping needs of both the partners. Your individual preferences concerning size, comfort, support, brand reputation, and warranty are some of the items that matter the most when it comes to choosing the perfect bed. First things first, the bed must have enough room and space for both of you. If your partner’s late night tossing and turning is a problem for you, maybe it is time to look for a bigger bed. The ideal size for an average couple is Queen, but you can opt for a King or California King-sized or bed if both of you need your own space while sleeping. 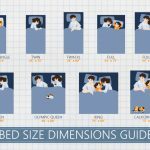 Be sure to check out the mattress size charts before you make a purchase. Having good motion isolation is one of the most important things for some couples. For example, if one partner is a back sleeper that is prone to repositioning and is much heavier than the other partner who is a side sleeper. Without low motion transfer, the lighter partner could have trouble sleeping if they are a light sleeper. You have couple options here. Compromise – This is always the best and cheapest option. With the four choices, we listed here, 90% of you will be able to find a good bed that suits both partners. Find an adjustable firmness mattress – Sleep number is famous for providing adjustable beds where both sides can have a different firmness level, and there are also double-sided products out there. Memory foam options are great for minimizing motion transfer but you might lack that bouncy feel of custom foam or hybrids that some people love. The next step is to decide whether you prefer a hard, medium, or soft feel. This decision depends on your body type and favorite sleeping position. Most of the cheaper brands offer a medium to firm feel which work well for a lot of people, but side sleepers may have extra pressure relief considerations and need something on the softer end of the spectrum. If you prefer a softer feel, you can either invest some money in a great mattress topper or opt for a mattress model that features a softer feel to begin with. Although the price of a mattress does not always reflect on its quality, it is possible that the cheaper brands might lack appropriate pressure point relief and durability when compared to the slightly higher priced options. This is why it is important for you to get an understanding of the product. Since the invention of bed in a box – a regular mattress that is compressed and vacuum-sealed in a box, there has been an increase in the number of online orders. Although it is possible that even if you made a fairly calculated purchase, there are some instances in which you might not be entirely satisfied with your bed. One of the top reasons to purchase a boxed bed online is the amazing return and refund policies offered by most of the famous brands. It generally requires little to no hassle on the part of the buyer. So, you can literally sleep on it before you make your decision. Whether you are looking at purchase a new bed altogether or looking to exchange an old mattress for a new, comfortable option, investing some money in a decent bed in a box might have a lot more advantages than you might expect. A good night’s sleep is vital in the modern-day hustle and bustle. People who fail to get a deep, relaxing sleep on a regular basis can face a lot of physical and mental issues in the later stage of life. It is everyone's personal job to ensure they get rid of anything that comes in between themselves and a comfortable night of recuperation. These mattresses are designed to help you sleep more comfortably and always adapt to your preferred sleeping position to provide a good feel. Shopping online for a bed is way more convenient than traveling to the store and physically checking out each option. Also, the only way you can test a bed is by sleeping on it, and doing that as a couple might raise a lot of eyebrows with so many people around you. The next step after choosing a bed will be driving the thing to your house. Why go through all that hassle when you are able to choose and order a decent bed in a box online? You can take your time and browse through a plethora of options with actual customer satisfaction and review scores. There is a lot of information available online to help customers make a well-informed purchase. Curious about the top boxed mattresses? Click here to see our top picks. The fact that bed in a box does not take extra effort on the seller’s part for storage and transportation makes them a lot cheaper than the beds on display in showrooms and stores. The generous return and refund policies offered by most brands is also another incentive for buying a mattress online. All in all, investing some money in a great bedding system might be one of the best decisions you make as a couple. Also, buying a bed in a box is an excellent alternative to purchasing a one from the store. It has the potential to save you a ton of time and money, and you can select from a wider range of options and sizes. You can also try out various products and choose your favorite without spending extra money. You can take advantage of a ton of information available online on each of the product before deciding. Take your time to research fellow customer reviews and satisfaction scores for further analysis before you pick one. Hope this post helped you find what you are looking for. Let us know if you have any questions.